Each pocket mirror is 5.5cm in diameter and on the reverse the pink background features your personalised message in a classy font with swirls. 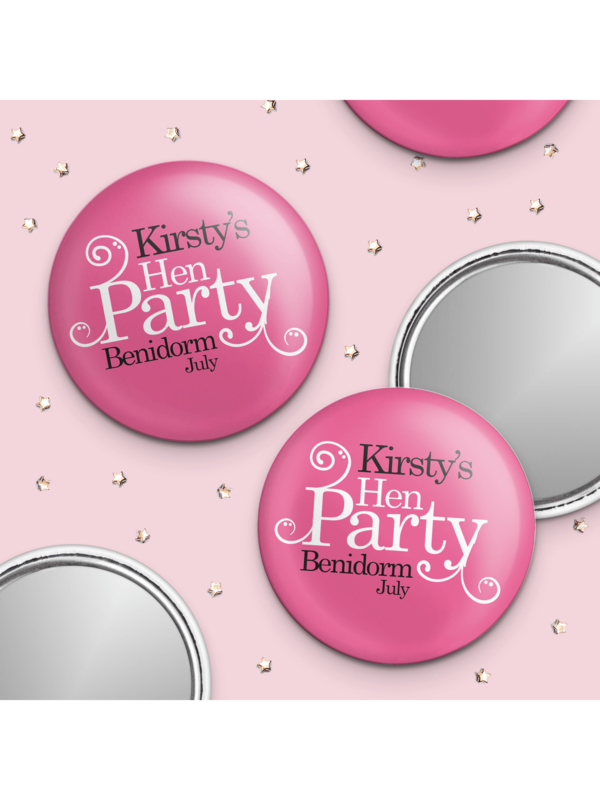 Showing our 5 Hen Party Superstore Swirly Design Personalised Hen Party Pocket Mirror reviews with an average rating of Excellent. Would you like to write a review? These mirrors are fab, so pleased with them. Perfect for little goody bags for the girls. Great item to add to a hen night goody bag. Very reasonable price for an itemized product. Well packaged on despatch. Smaller than I expected. It looks more like a badge from the front (and is the size of a standard badge). Delivery was quick though. Provides a quirky little gift to go in Hen's goodie bag.